Fun Mountain Biking Facts - Action heroes super site. Mountain biking is one of the most entertaining and physically demanding sports out there. 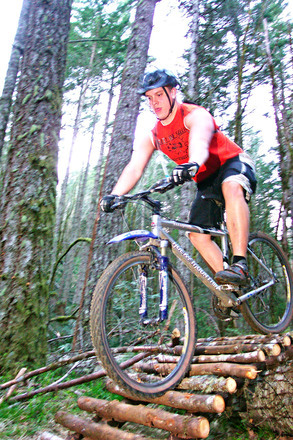 This sport involves riding bicycles off-road in steep and rough terrain. The bikes used in these activities are normally specially modified with different levels of gears to make it easier to manoeuvre through the most difficult of terrains. There are many forms of mountain biking, and they include cross country, slopestyle, freeriding, dirt jumping, trials and trail riding which is the most popular. This sport may seem a little costly, but You don’t need an expensive bike in order to enjoy the thrills of mountain biking. You can simply modify the bike you have like the buffalo soldiers did in 1896. Mountain biking was founded on 1983, and since then mountain biking facts have been on the rise such as the fact that the sport joined the Summer Olympics programme in 1996 at the Atlanta Games. Other mountain biking facts include the highest mountain bike race called the Yak Attack that happens every year in Nepal; it’s a ride through eleven stages and four hundred kilometres.